I went to FantasyCon last weekend and had a fabulous time. In my goody bag were a number of samplers for books. 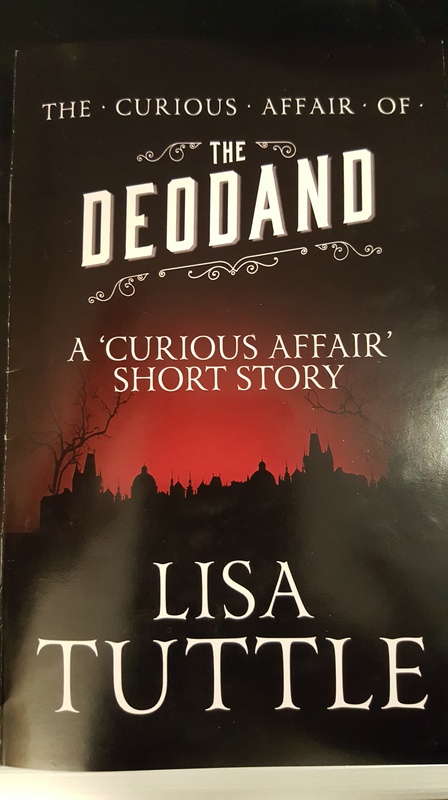 Unusually The Curious Affair of the Deodand is a complete short story and is what inspired Lisa Tuttle’s recent novel, The Curious Affair of the Somnambulist and the Psychic Thief. It is a Victorian detective story, very much an homage to the Sherlock Holmes stories, in which Jasper Jesperson and his newly hired assistant Miss Lane investigate an unsolved murder with supernatural elements. As I was reading I was sure I’d read or heard the story before and I think it was made into a radio play, but I can’t find it now. However the story appears to be available on the internet and was also published in the anthology Down these Strange Streets. Lisa Tuttle’s writing is wonderful. I don’t often enjoy short stories but this I liked a lot. I suppose I could call it a cozy horror. It’s creepy and the horror is hinted at, but like a cozy mystery it is genteel, the detectives are amateur, and has an intimate feel to it. I’m sure I’ll be reading the novel at some point.